Public speaker, Buford P. Fuddwhacker may look and talk like a country bumpkin but behind his simple demeanor lies a deep thinker and philosopher. When you bring him into your conference or business meeting as a speaker, you don't just get an entertaining humorist... you get a self-published author and philosopher. Buford's profound insights are sprinkled throughout his public lectures, speeches, keynotes and seminars. You won't find his books in bookstores, and you can't buy them through mail order or the Internet, but your group can hear about the wisdom that's found in their pages by hiring Buford as the public speaker for your next event. "Technolergy's yer frend! Don't let it intimydate yew and don't worry that some young kid's agonna git yer job jest becawse yew ain't a technolergy genius. My book kin transform yew into a computer geek in nothin flat. Lern all the hi-tek buzzwords. Lern to think and look like a tekno-geek. 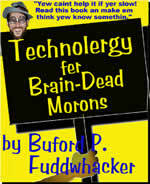 If yer a 98-pownd technolergy weakling and all them computer science majors are kickin bits and bytes in yer face, read my book and then go back and teach em a lesson!" "Negative thoughts is like rabbits. They kin run thru yer thoughts all day long, and lotsa folks goes chasin after em. But don't do it! Chasin rabbits is fer hound dogs. Read my book and lern abowt the 7 most common negative thoughts that'll try to git yew to chase em. If yew meet up with em, just lettem go by." 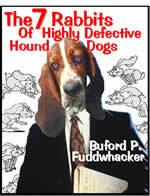 "Put yer hound dog owtta his mizzery and join the ranks of the fortunate few!. Git yer attitude strait and yer on yer way to success in life. As a public speaker, I go all over the world preachin abowt the power of positive attitude. Call me in to speak at yer meetin and I'll reveal all the secrets of my book and give yew Fuddwhacker's Formula Fer a Fortunate Future!" "A sales person who don't know how to close might as well walk into the prospects office nekkid! 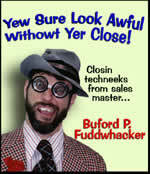 Cawse in sales, closin's the most importint skill yew kin master. Read my book and lern my tried and true master closin tekneeks. Arm yerself with these powerful tools and yew'll never go owt on a sales call nekkid again! 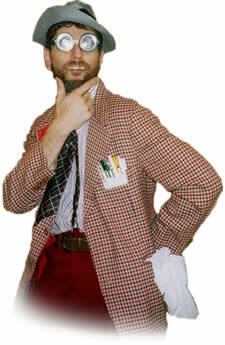 "Don't never fergit, they ain't no better profeshun yew kin have than bein a sales person. On the other hand if yer in sales, always remember, yew sure look awful withowt yer close!" Buford's horse-sense philosopy of balanced living and positive attitude is at the core of his teachings and is evident in his life, his books and his keynotes & seminars. Let him energize and inspire your group and motivate them to success! Contact Buford now and make him the public speaker for your next event!